October Book Photo Challenge – Day 21: Short but SweetDay 21 of the challenge from Books and Cupcakes! Today’s fans of The Hunger Games may be surprised to find that the series owes much to two darker works by Stephen King, published in the Seventies and Eighties under the pseudonym Richard Bachman. 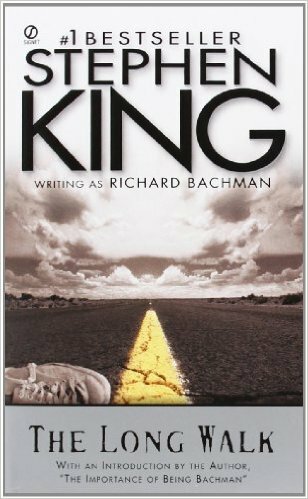 The first, The Long Walk, was written by King while a freshman college student in 1966-1967. In a future version of the U.S., 100 teenage boys participate in a national competition called The Long Walk. The winner takes a prize of his choosing. 99 losers face a grim fate. As a companion piece, check out Stephen King’s The Running Man. In 2025, a poor man has only one option left to provide for his family: running for his life in a sick television game show.